Amsonias deserve a wider audience. They may not be glorious performers, but good borders need a strong supporting cast of summer perennials to flatter the prima donnas. Amsonias do just this. They flower reliably year after year, they are not pushy or invasive, they are rarely fussy about soil or situation and they are very hardy. Amsonia hubrichtii provides three seasons of interest. It comes into bloom around the second week of May and continues until the end of June. From a distance the flowers have an almost lily-like appearance. The muted slate-blue flowers and slender blue-green leaves create a perfect foil for those plants that love the limelight, for instance, the fiery Crocosmia 'Lucifer' or the black-eyed magenta Geranium psilostemon. The steely blue flower colour also compliments white, silvery, and pastel partners. Once the flowers fade, the plants can be sheared back by half. The trimmed clumps regrow quickly are much more tidily bushy for the rest of the season. They return to a rich green colour with a fine texture, and dense, mounded habit. This simple pruning step also removes the developing seedpods and prevents self-sowing if seedlings aren’t required. The foliage makes a pleasing contrast for partners with broad and/or light-coloured leaves. 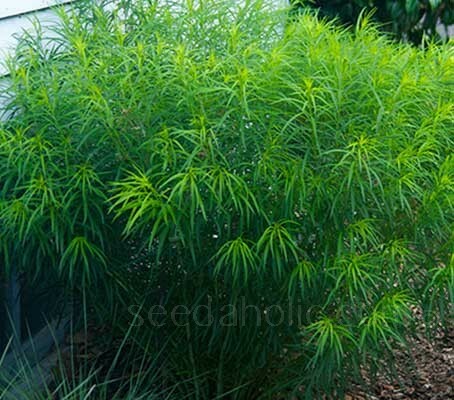 Growing to a height of around 90cm (36in), with feathery, soft-textured, needle-like, bright green alternate leaves Amsonia hubrichtii does a super job covering the leafless lower stems of perennials such as roses and for covering the lower stems of summer bulbs, such as gladiolus, lilies, and tall alliums. The clumps aren’t strong enough to hold up much taller or heavier plants, but they can prevent somewhat sprawling, lightweight partners from falling all the way to the ground, and this mingling can make for some pretty vignettes. 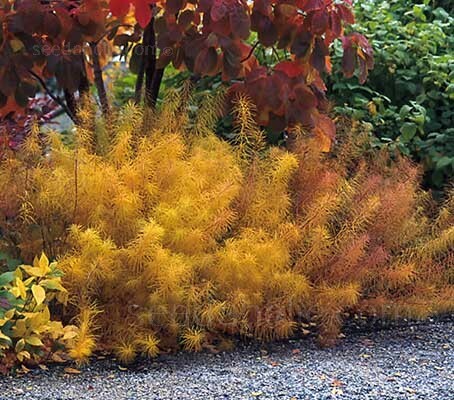 In autumn Amsonia hubrichtii reaches its true glory when the leaves and stems turn brilliant gold to amber. It maintains a presence through autumn frosts, and its dried stalks are stiff enough to stand up to ice and snow, even as late as February. Adaptable to many soil conditions as long as they drain well-including heavy clay. Extremely tolerant of drought, thriving with no supplemental irrigation in summer. Full sun to quite a bit of shade. This is an extraordinary long lived designer perennial that deserves wider use. Amsonias prefer moist soils and grow well in any garden soil, including clay. They will grow in full sun or semi-shade. The plants are drought tolerant and generally do not wilt in dry spells. Drier conditions reduce the height of the plant, but they will flower well every year. In drier situations they are happiest in semi-shade. Amsonia germinate best if they experience a cold period. If you are planting in autumn to winter you can use the natural method, simply planting in a seed tray and placing the tray outdoors until the spring. Otherwise, at warmer times of the year it will be necessary to artificially simulate winter temperatures by using the method of stratification. Fill 7cm (3in) pots or trays with a good soil-based compost. Sow the large seeds onto the surface and gently firm down. Cover the seeds with a sprinkling of fine grit. Fill seed trays with a good soil-based compost. Sow the large seeds onto the surface and gently firm down. Cover the seeds with a sprinkling of fine grit. Place the tray or pots in a cold frame, an unheated greenhouse or under a shaded hedge. Keep the soil damp but not wet and do not exclude light. Patience may be needed as germination can be very slow taking anything from 30 to 365 days, although germination can be quicker if temperatures are around 15 to 20°C (16 to 68°F). When seedlings are large enough to handle, transplant them into 7cm (3in) pots and grow them on in cooler conditions until large enough to move outdoors. Keep the seedlings in light, but not full sun and plant out in autumn. If you require seedlings quicker, you may wish to try stratifying the seeds – this method simply exposes the seedlings to temperature changes, as they would do if germinating naturally. Sow the large seeds onto the surface of trays or pots containing good soil based compost and gently firm down. Place in a propagator or seal inside a polythene bag and keep at a daytime temperature of 13 to 15°C (55 to 60°F) for 2 to 3 weeks. After this time, move the tray to a refrigerator to cool (not a freezer) this will expose the seeds to temperatures of around 4°C (39°F) which will simulate the cold of winter. Leave them in the fridge for 3 to 6 weeks, after which remove the tray and place somewhere with normal daytime temperatures. Keep the compost moist at all times. This method usually works for some of the seedlings but some seeds may wait for spring before emerging regardless of when or how they are sown. Prick out any seedlings that have germinated into pots to grow on, then place the tray back in the cold frame so that any seeds that remain may germinate naturally. Plant Amsonia at a distance of 30cm (12in) apart, in any well-drained soil in sun or dappled shade. Amsonias plants are slow to get going in the garden, these slow-growing perennials form tight clumps that do not need regular division or staking. They can, if needed be divided in early autumn and replanted straight into the soil. Due to their milky sap, Amsonias are often bypassed by foraging mammals, which makes them somewhat resistant to deer and other pests. Although they only contains two to five per cent latex which can irritate the skin, this slight toxicity has one major advantage - slugs and snails never damage the emerging shoots. The flowers can be cut and used in floral arrangements, wear gloves and sear the end of the stems in a flame to stem the milky sap before popping in a vase. Amsonias have some of the funniest-looking seeds around. The seed pods are long tubes that are filled with cylindrical brown seeds arranged end-to-end. The seeds ripen in late summer to autumn, quite a long time after the plants bloom. Harvest them when the pods are quite dry and tan in colour, but before they split apart lengthwise to drop their seeds. They germinate quickly when sown straight away. If stored, the seeds may need to go through a cold season before germination. Cottage gardens, Borders and beds, Low maintenance gardens, Shade and Woodland gardens. Amsonia is a genus of about twenty species, native to temperate climates in North America, Europe, and Asia. It occurs in moist to wet woods, floodplains, and riverbanks. Amsonia hubrichtii is an uncommon perennial that is native to the Ouachita Mountains in central Arkansas. It is very similar in appearance to the Missouri native Amsonia ciliata, except the leaves of A. hubrichtii are more narrow and thread-like and the emerging foliage lacks conspicuous hairiness. 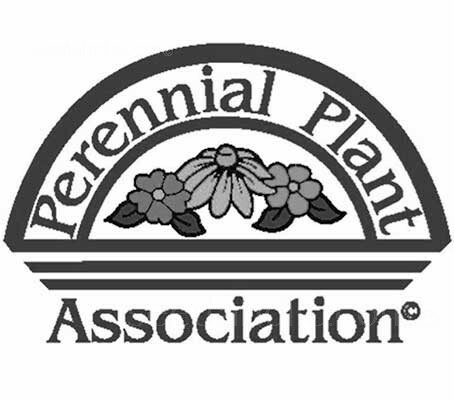 The latest taxonomical wisdom places them in the apocynaceae family, which they share with several hundred other genera, including Asclepias and Vinca. The genus Amsonia is named for Charles Amson, a U.S. traveller-scientist who lived in the 18th century. This species was found by naturalist Leslie Hubricht in 1942 quite by accident. Mr. Hubricht was an employee of the Missouri Botanical Gardens at the time, so he was well versed in identifying plants. But his true passion was collecting as many species of land snails as he could find. Mr. Hubricht had gone to Arkansas in search of interesting land snails, he found the unusual species of Amsonia growing in the wild and brought it back to his supervisor at the Botanical Garden. This was not only an unusual plant, it was a completely new species. The new species was named Amsonia hubrichtii in honour of him. 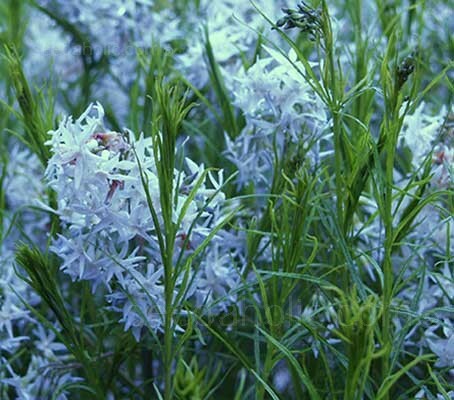 It is commonly called Threadleaf Bluestar, Narrow Leaved Amsonia, Arkansas Bluestar or Hubricht's Amsonia. Leslie Hubricht (1908-2005) was an American biologist and malacologist (the study of molluscs). If he had lived in a previous century, Hubricht would have been called a 'gentleman naturalist'. His formal education ended after one semester of high school. His informal education lasted his lifetime. Professionally, Leslie Hubricht worked as an assistant at the Missouri Botanical Gardens from 1936 to 1943, then, until 1973, he was employed by Remington Rand as a tabulating machine mechanic and as a UNIVAC repairman. Much of his time, however, was devoted to one or another aspect of natural history, including plants, cave life, and amphipods and isopods. He was especially devoted to the study of the terrestrial molluscs of the eastern United States, a field in which he was termed a 'world authority' by Alan Solem, Curator of Invertebrates at the Field Museum of Natural History in Chicago. Hubricht himself named 81 kinds of land snails from the eastern United States. His list of scientific publications contains 147 entries. Hubricht had three species of plants and 26 kinds of animals named in his honour. They grow well in any garden soil including clay.